If men lie in this world, what makes you so sure they'll be honest in the next? 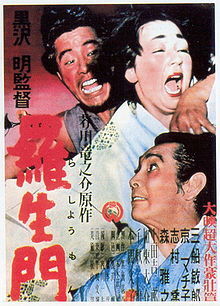 Rashomon is a 1950 Jidaigeki film in which a heinous crime and its aftermath are recalled from differing points of view. The film has an unusual narrative structure that reflects the impossibility of obtaining the truth about an event when there are conflicting eyewitness accounts. In English and other languages, Rashomon has become a byword for any situation in which the truth of an event is difficult to verify due to the conflicting accounts of different witnesses. Directed and written by Akira Kurosawa and Shinobu Hashimoto, based on the short story "In a Grove" by :Ryūnosuke Akutagawa. Woodcutter: I'm the one who should be ashamed. I don't understand my own soul. Masako: A man has to make a woman his by his sword. Priest: If men don't trust each other, this Earth might as well be hell. Commoner: Right. The world's a kind of hell. Priest: No! I don't want to believe that! Priest: A man's been murdered. Commoner: So what? Only one? Why, up on top of this gate, there's always five or six bodies. No one worries about them. Commoner: Well, men are only men. That's why they lie. They can't tell the truth, even to themselves. Priest: That may be true. Because men are weak, they lie to deceive themselves. Commoner: Not another sermon! I don't mind a lie if it's interesting. Rashomon is the closest to "perfect" a film can get. German filmmaker Werner Herzog, in the film Inside the Edges.